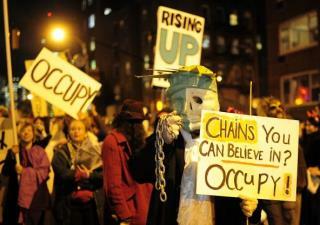 (Newser) – Is Occupy Wall Street inadvertently hurting the little guy? That’s what Marc Epstein, owner of Wall Street’s Milk Street Cafe, claims. Thanks to the protests—and the resulting police barricades that line Wall Street, which he says somewhat hide his eatery and make it difficult for people to enter—sales are down 30%. So Epstein had to fire 21 of his employees last week, he tells DNAinfo. "What are [the protesters] trying to accomplish here?" Epstein says. "The end result is that I and all the wonderful people who work for me are collateral damage." Amazing how dumb liberals are! OWS has cost at least 21 people their jobs (and no, they are not minimum wage jobs depending upon how well New Yorkers tip), a "revitalization business" might go under proving that NY cannot be revitalized, an investor who put up his own money in order to give jobs to others might lose it all, they are advocating what the Greece Socialist Party advocates and see how well that works. Exactly how many people do these idiots have to hurt before they wise up? You know, if that business owner just came to the drum circle and explained what was happening, a lot of the protesters might by meals from him to make up for his lost business.